It’s an early August late Monday afternoon, and Lata and I meet up in the Sebastopol Plaza. Monday is Lata’s shopping day and she has given me some of her precious time to tell me her story. When she moved here in 2003, Lata took a job cooking and waiting tables at Howard’s Station Café in Occidental. A few years later, when the Farmers Market moved to its current location, Chris Martin,the owner of Howard’s, and his daughter, Jenay, suggested that Lata sell her samosas on the stairs of Howard’s during the market and that’s how it all began. For those first markets during her first year, Lata would sell 10 or so samosas and people began to ask her if she did other dishes as well, so she’d make 2 or 3 orders of saag paneer and sell that, and then she just grew from there. She graduated from the stairs to a table and umbrella and then to a full canopied stall. At a typical market these days, Lata does over a hundred orders of her famous potato and pea samosas (accompanied by two delectable chutneys—coconut cilantro and tamarind), and about as many orders of her main dishes (chicken tikka, vegetable korma, saag paneer, and seasonal pumpkin and eggplant curry). Her drinks are astoundingly delicious, “the best chai in the world” (according to my mama who is a chai aficionado), and mango or peach lassi. 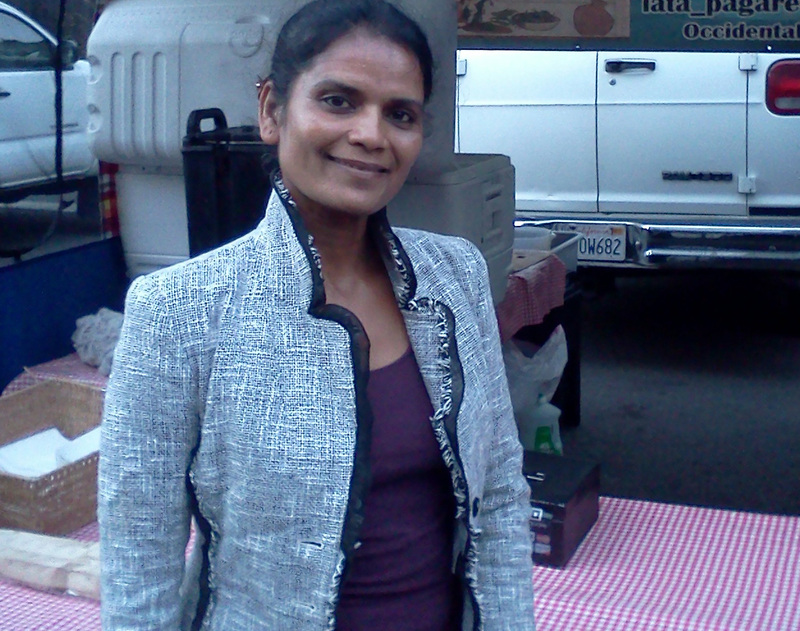 After a year and a half of cooking for the market and continuing to work at Howard’s, Lata, with the Martin family’s blessing, decided to leave Howard’s and work for herself full-time, cooking for the Occidental and Sebastopol Farmers Markets. She was very nervous about how it would turn out, but she took the risk and is very pleased with how things have gone. She was even able to bring her two sons over from India to live with her in Occidental and become United States citizens. Lata asks me if I want to know the secret behind her tasty food. Of course I do and I urge her to tell me! She says that in February of every year, she returns to the village in which she grew up, in the state of Maharastra. Her parents live there as do her brother and two sisters. Lata visits with her family and friends, and when she leaves, she brings home about 40 pounds of spices, enough to last her for a year of cooking at five farmers’ markets. Throughout the year before her visit, her parents gather and grind all of these spices in their village! “The food I cook has home feelings in it, it is cooked how it is supposed to be cooked in my village,” Lata explains. Lata gets much of her produce from the farms along whom she works side by side at the markets—Singing Frogs, Bohemian Collective, and New Family Farm. In the off-season, she gets most of what she needs from Andy’s Produce. She tells me with a smile that she uses fresh coconut in her coconut-cilantro chutney, and that is the hardest part of her job, breaking open all of those coconuts! And then in a flash, I know why Lata has been so well-received in bringing her Indian food to our local farmers markets. She has brought together two very different communities with her food and her heart—her home village in India and her place here in Sonoma County, and she has impeccably and tastefully blended them; people can taste that!